Anatomy is the basic subject in medical Science. It is considered as one of the tough subject in first year. If you Studying snell anatomy, grays anatomy, clinically oriented anatomy, etc. is difficult for you then BRS Gross Anatomy is the only solution. It is a handy Book for every student for USMLE and other exams. You can download this book in pdf format at the end of this reviews. Also, you can buy Brs gross anatomy hard copy at discount price from the link given at thye end. 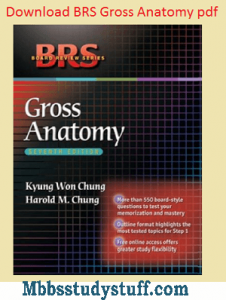 BRS Gross Anatomy is written by Kyung-won Chung and Harold M. Chung.Both of them have written many books related to the field of medical and received many awards and honors. BRS Gross Anatomy book is one of the best book for medical as well as for dental and physical therapy. This book is a short book but contains all important topics as in a standard book. Illustrations are there and summary is the best source to remember topics easily. This book contains explanatory diagrams which are very helpful in understanding respective topics. BRS book has been updated regularly and currently has the latest 6th edition. This book is a recommended book for the professional exams and for USMILE. The comprehensive examination at the end of the book is one of the best key features for the preparation of exams. Comprehensive embryonic notes are also there where it is necessary for respective topics. i need link to download this book..
could I possibly receive the link for download? Hello! I'm Arshad Bangash the owner and writer of this blog. I'm a hobby blogger and MBBS student of Ayub Medical College Abbottabad Pakistan. I blog to help others and share my knowledge with others.